If you're feeling indecisive about revamping your home's style, we can't blame you. Today's trends seem wildly divergent: modern minimalism might make your space feel luxe and sleek, but boho-chic promises fun, color, and drama. Don't feel bad about your indecision — because there's no need to choose. Done correctly, boho's funky textures and vivid color palettes won't compromise minimalism's streamlined elegance. Pick and choose your perfect colors and select boho-inspired accents to turn your space into a genre-bending wonderland. Here's how you can combine the two styles seamlessly so everything makes sense. Your space doesn't need color to feel boho-chic. 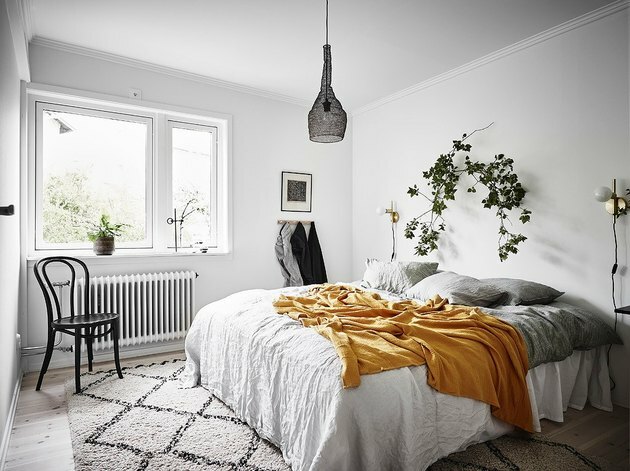 This minimalist bedroom by Mowo is still bohemian at heart, despite the muted color scheme. 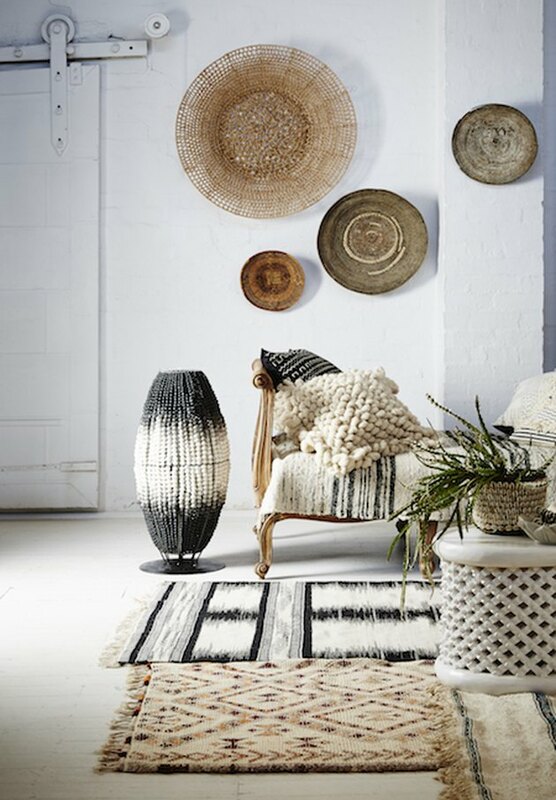 A wide variety of textures, from fringe to rattan, to rumpled linen, make this space oh-so-dreamy. 2. Pair symmetrical, clean lines with soft, textural textiles. Minimalism is known for balance and simplicity, so clean lines and symmetry are a common occurrence. 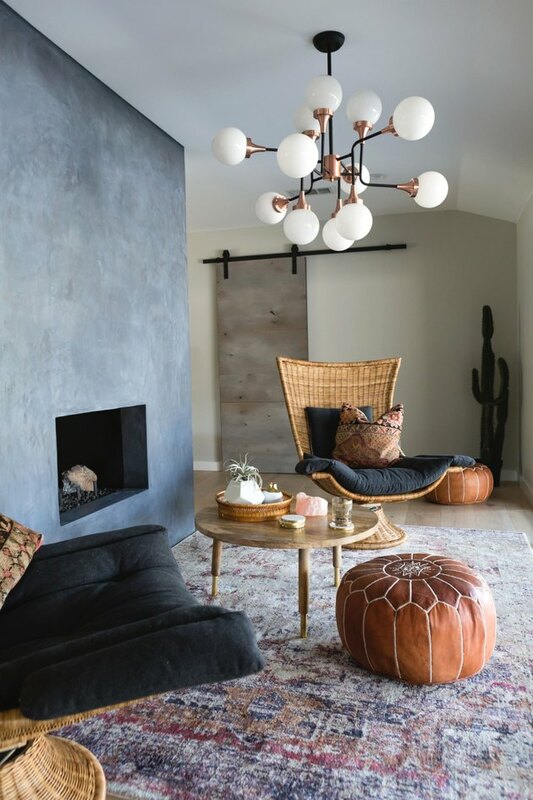 Add a few soft textiles and textural details that exude boho flair to help soften those straight lines, creating the perfect middle ground between minimal and bohemian va-va-voom. 3. Use boho accents sparingly. 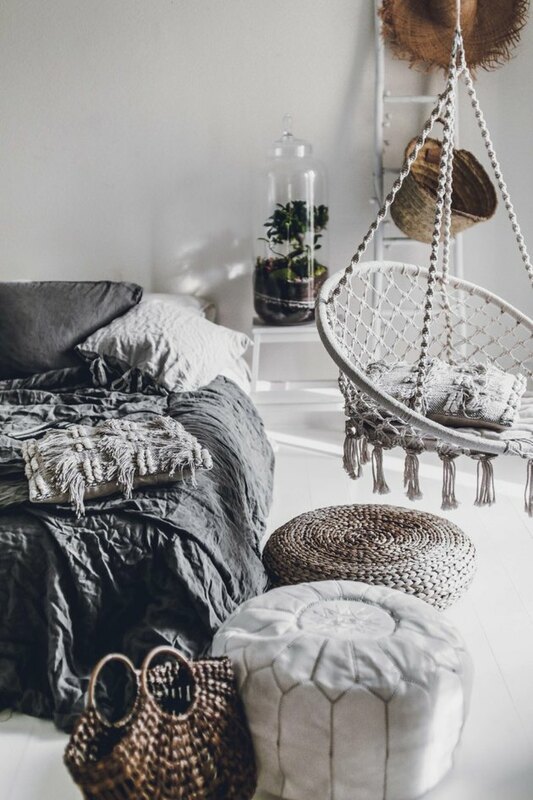 It only takes a few subtle bohemian vibes to liven up a minimalist room in a snap. 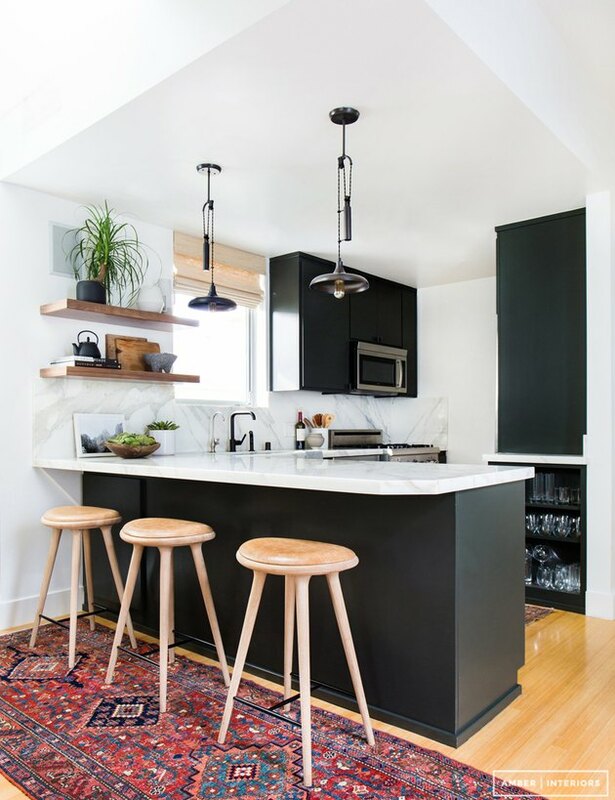 This black-and-white kitchen from Amber Interiors upgrades its simple color scheme with a few well-placed accents, like a colorful rug and gregarious foliage. Pairing minimalism's traditional white walls with a hodgepodge of decor feels utterly avant-garde. Don't let perfectionism constrain you: Put your plants where they please you and don't even bother hanging your art. 5. Sometimes less is so much more. 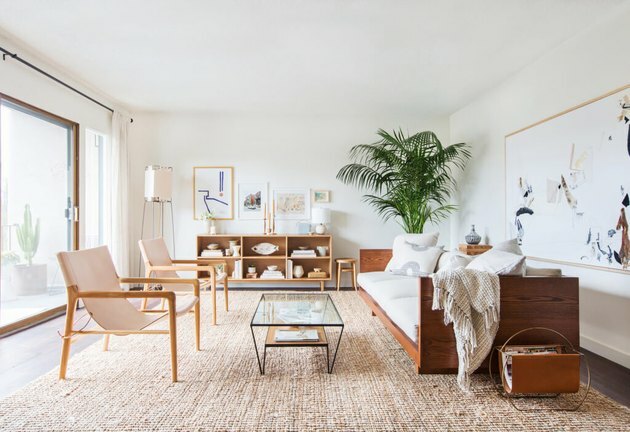 Boho-chic style centers around vibrant colors — but minimalism embraces Mies van der Rohe's 'less is more' philosophy. Merge the two styles with neutral walls and a select few jaw-dropping, colorful bohemian accents like Moroccan style poufs. Bohemian rooms should feel airy and bright. 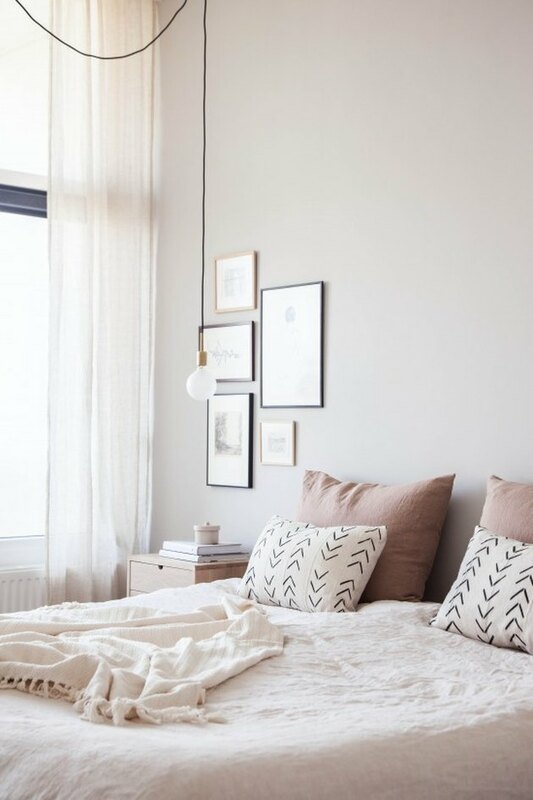 Keep your wall decor minimal and install gauzy, linen drapery panels at your windows so you can enjoy the natural light while maintaining your privacy, giving your bedroom a lovely ethereal glow. 8. Add visual interest with shapes and patterns. 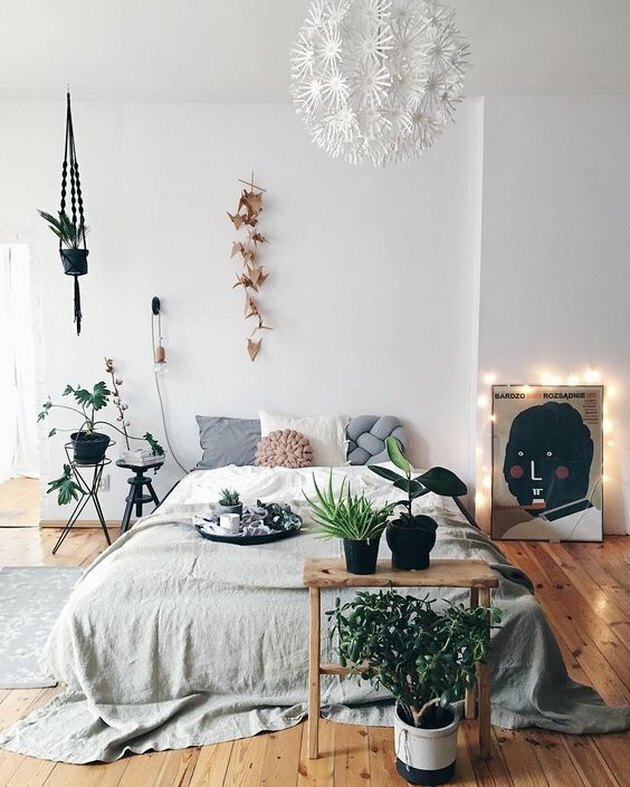 A minimalist setup doesn't mean plain walls and flooring — especially if you're trying to integrate bohemian styling. Add some drama and visual interest to your home by playing with patterns, shapes and textures like this accent wall featuring a collection of round, woven dishes. 9. Show off your passions. 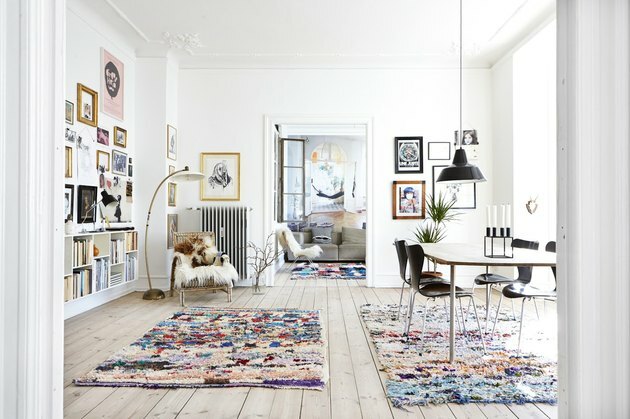 When you're searching for fun, unique accents for your boho-chic-slash-minimal space, don't forget to consider yourself. 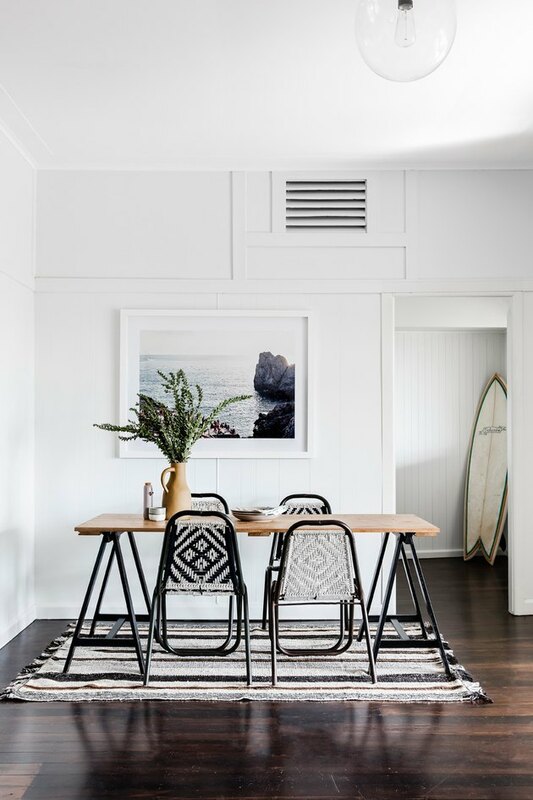 A love of the ocean is clearly integrated into this charming dining room bringing the outside in and making every inch of this coastal-inspired retreat feel personal. 10. Leave the walls bare. 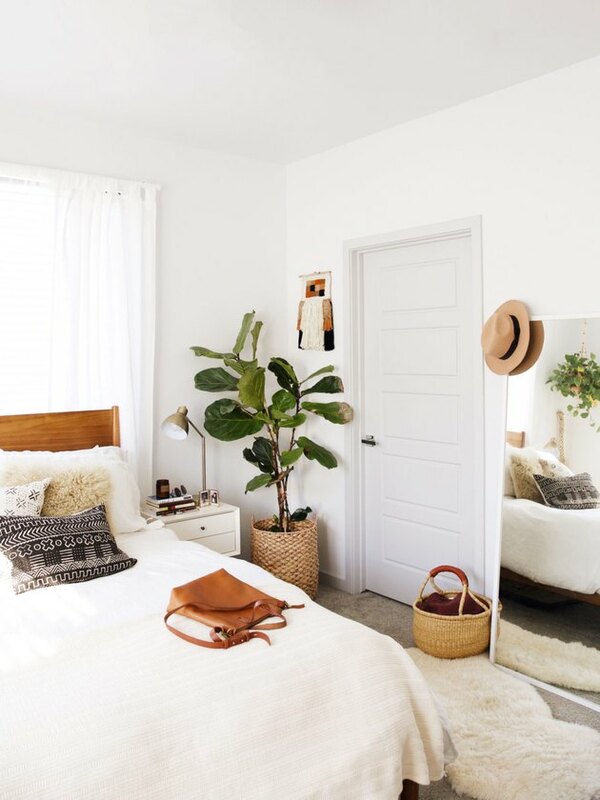 There's an easy way to divide your room between boho and minimal: Leave the upper portion of the room bare, and let the bottom half go wild. Stack your sofa with colorful accent pillows, and warm up the floor with a gorgeous patterned area rug. 11. Silence your fear of clutter. Stuffing too many tchotchkes into a space can feel crowded, but don't let a fear of clutter keep your home sterile. 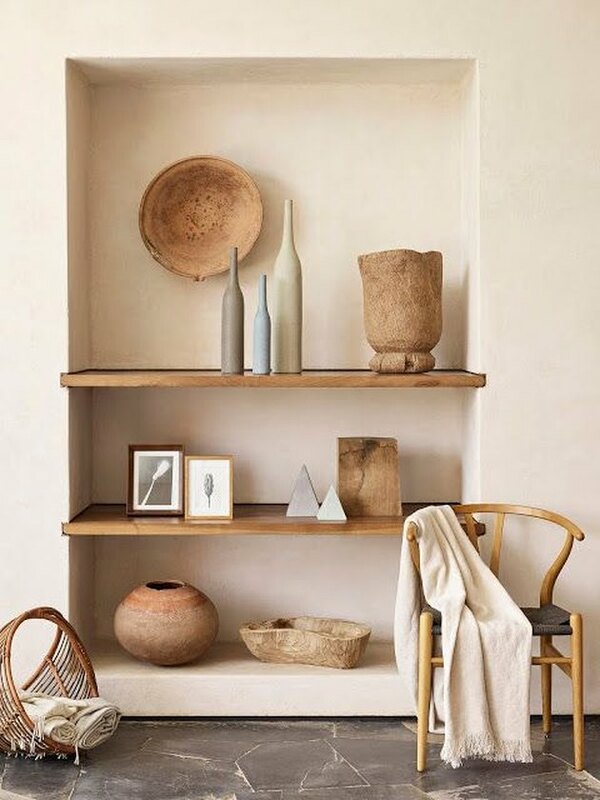 Even though this niche with built-in open shelving is chock-full of creative bohemian-inspired knickknacks, it still feels sleek and minimal. 12. Colorful accents work wonders. Colorful accents are the perfect accompaniment for a boho-minimal room. Pair vibrant, funky area rugs with a interesting gallery wall to make the space scream style. Just don't add too many accessories, otherwise you risk going overboard. Not sure if you're committed to the colorful boho-chic trend? Start small. Swap out plain textiles for something with pizzazz, like this marigold bed throw. Pair that with a simple pattern area rug and a hang a little leafy flourish for interior design gold.